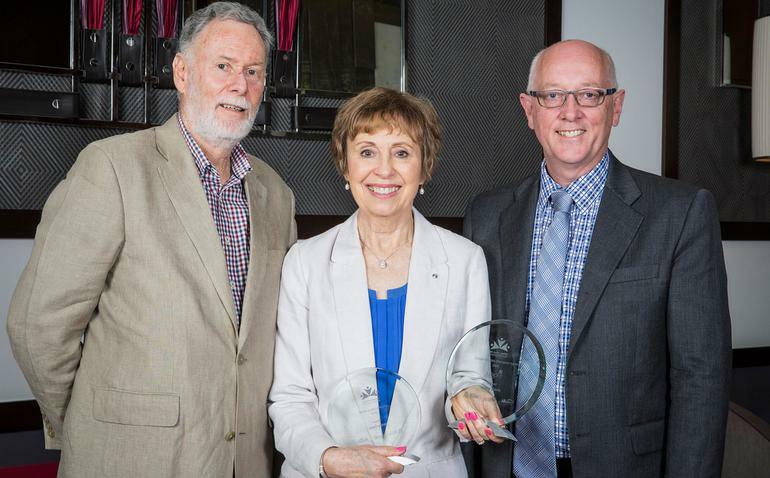 Western Australian senior Jenny Davis has been recognised for her outstanding work to improve the lives and wellbeing of older people throughout the community. Ms Davis, a 67-year-old actor, writer and producer, has made a significant contribution to the Western Australia community through Agelink Theatre, a production company she founded nearly 25 years ago. She received the Juniper 2016 WA Seniors Champion Award, in recognition her contribution, from Juniper Chief Executive Vaughan Harding this week, as part of WA Seniors Week 2016. “Agelink’s aim to honour and affirm the value of older people, through their lives and stories reflects Juniper’s values as we strive to provide a good life for all our people, Mr Harding says. All of Agelink’s productions involve seniors sharing their stories and memories during workshops and some productions feature seniors onstage with professional actors, either playing a character or being interviewed during the show. Ms Davis came to Australia in 1976 and has been involved in the Perth theatre scene as an actor and director since that time. She has toured as a performer and director nationally and internationally and has worked for major companies staging Shakespeare and classics to drama, comedies and farce. Since 1993 she has brought entertaining and emotionally moving works to the community and in doing so has helped enrich the lives of all involved. The Juniper 2016 WA Seniors Champion Award is the premier honour of this year’s WA Seniors Awards, hosted by the Council on the Ageing WA and the Department of Local Government and Communities to acknowledge the rich and rewarding service of our seniors. “We are proud to sponsor the Juniper 2016 WA Seniors Champion Award, a fitting tribute to an outstanding individual for their commitment to the Western Australian community,” Mr Harding continues. He adds Ms Davis is a worthy winner and commended her efforts to tackle seniors’ issues such as social isolation and other challenges of ageing while informing younger generations about the lives and times of older people and their contributions to the community. The awards’ judges noted Ms Davis’ longstanding service and the benefits that interactive shows have on people, particularly those with dementia. “Jenny is a prime example of an individual who is brightening the lives of people across the State,” Mr Hardin says.